A vanilla flavored powder that is made by grinding dried vanilla beans into a fine textured powder. When heat is applied to the ingredients, Vanilla Powder holds its flavor better than a vanilla extract, making it best suited for flavorings used for foods that are heated in some manner, such as baked goods or tea and coffee. It is also a good flavoring to use with fresh fruits, with dry mixes or in any preparation that may need a light rather than a dark colored vanilla seasoning. For recipes, 1 tablespoon of pure Vanilla Powder is equal to 1 tablespoon of vanilla extract. 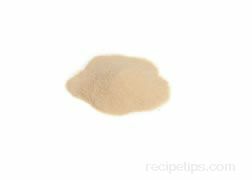 Vanilla Powder may be somewhat difficult to find but can generally be located in some food stores, cake decorating supply stores, gourmet markets, and through specialty mail order services.